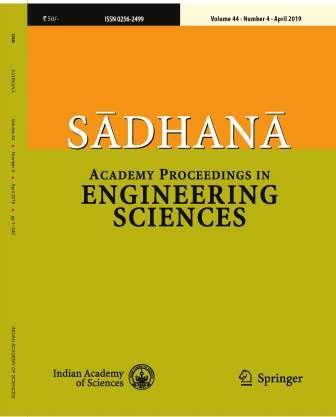 Sadhana- Academy Proceedings in Engineering Sciences published by Indian Academy of Sciences, Bangalore is a monthly peer reviewed journal, published 12 issues per year from 2016. It is a leading journal of Engineering Sciences in India since 1978. From 2007, Sadhana is co-published with the International Publisher, m/s Springer. All the papers are submitted and published in English. We have a three tier Editorial Board with the Editor, Seven Senior Associate Editors and more than 60 Associate Editors. We have a galaxy of subject expert reviewers. All the papers go through a senior associate editor, an associate editor and 2-3 reviewers. Thus all submitted papers are rigorously reviewed by the experts. Sadhana publishes regular Papers in English presenting results of original work in engineering sciences including computer science, Energy systems including solar and nuclear technologies, Smart cities, smart water and power grids, electronics, Mechanical engineering including mechanics (fluid, solid, thermal), aerospace engineering, Systems analysis and optimization, recent advances in Civil and Chemical Engineering etc. Apart from regular papers, Review papers and Survey papers are also invited for publication. The editorial board wishes particularly to encourage original contributions making fundamental contributions in theory, technologies or practice. Papers summarizing of national projects such as Mangalyaan or papers on development of Indian projects paying attention to the problems peculiar to our country and new to the project innovations are welcome. Sadhana Letters: This is a new category introduced in Sadhana. Letters usually describe a single result, experiment, or technique of general interest for which a short treatment is appropriate. Letters are subject to an expedited review process and substantially faster publication than regular papers. Letters can include counter-examples of previously published papers, or preliminary results of significant current research of wide interest. Normally, the editors of Sadhana will review these submissions internally, but they can request external reviews when appropriate. Letters should not exceed 4 pages. Sadhana also brings out a Special issue on theme-based topics or in the frontier areas of engineering sciences. Regular papers, review articles and survey papers and proposals for special issues are reviewed by the Editorial Board. All these need to be submitted to the Editor in a prescribed format that is available on Sadhana website. Authors should submit only papers presenting results of their original research not previously published and not under consideration for publication elsewhere. Authors are requested to prepare the manuscript following the instructions carefully before submission.. Corrections/alterations should be avoided after acceptance. On-line submission of manuscripts to Sadhana (www.editorialmanager.com/sadh/) in the Regular paper format following the guidelines presented in the sample TeX source file using the Sadhana style file will result in quicker and more efficient processing.